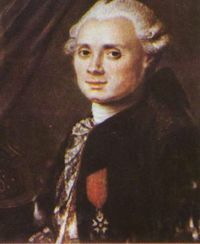 Charles Messier was born in 1730 in the small provincial town of Badonviller in the independent dukedom of Salm; now in France near the German border (Lorraine). His family was one of the richest in the state, with high ranking positions and excellent connections, which would later be very helpful to Messier. In the middle or the 18th century, astronomy stood at the threshold of a great observational age. Astronomers grew increasingly familiar using telescopes to search the night sky, finding ever more faint and exotic looking nebulae, although at the time these fuzzy blobs were regarded as trivia, not being important and were certainly not understood. Comets were the fascination of the age, their discovery and subsequent observation occupying many observatories; bringing fame and fortune (to some extent) to their discoverer. Messier’s interest in astronomy was kindled with the appearance of the six tailed comet of 1744. He was hooked and using family connections, at the age of 21 Messier travelled to Paris to work as an assistant draftsman and astronomical observational recorder to the astronomer Joseph-Nicolas Delisle. Messier was instructed in the use of astronomical instruments and by 1754 was an experienced observer continuing the work of Delisle after he retired. Messier was obsessed by comets, Messier saw the 1759 return of Halley’s comet and over the next 15 years most comet discoveries were made by Messier, and in all he claimed to have discovered 21, though this is now challenged. By the 1760’s Messier was regarded as the leading French astronomer, he was a member of the Royal Society in London and the Berlin academy and was finally admitted to the French academy of Science in 1770. It was to this institute that Messier submitted his great catalogue, the works for which we remember Messier. From around 1758 Messier had noted down all the fuzzy, nebulous objects he had encountered while searching for comets, these he listed and by 1781 his published catalogue contained 103 objects. 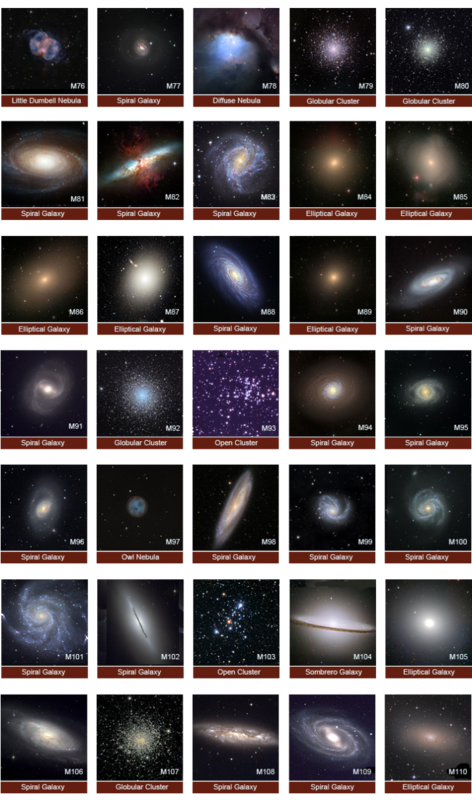 Not all of these were actually discovered by Messier, some were noted by Pierre Mechain who was Messier’s contemporary, though Messier did check most of his colleague’s observations. Over the years this catalogue was revised and his final version published in 1781 contained 103 entries. Historical evidence collated between 1921 and 1966 credit Messier and Mechain with another 7 objects bringing the total accepted today to 110. In 1805 Mechain became the director of the Paris Observatory while Messier received the cross of the legion of honour from Napoleon. Messier died in 1817 at the age of 86 yrs. Messier once wrote: “what made me produce this catalogue was the nebula I had seen in Taurus 1758 while I was observing the comet of that year. The shape and brightness of that nebula reminded me so much of a comet, that, I undertook to find more of its kind to save astronomers from confusing this nebula with comets". Little did Messier know that his faint nebula in Taurus (M1) would become one of the most observed objects in the heavens - the supernova remnant we call the Crab nebula. 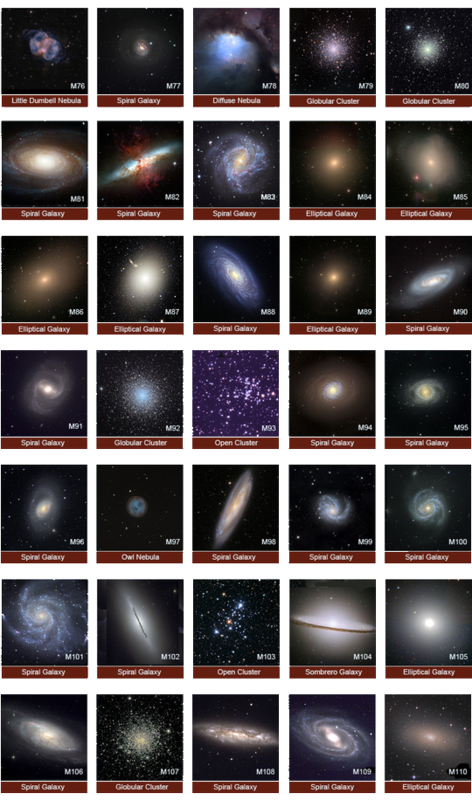 telescopesinhistory.com). Click for a slightly larger view of each chunk of images. 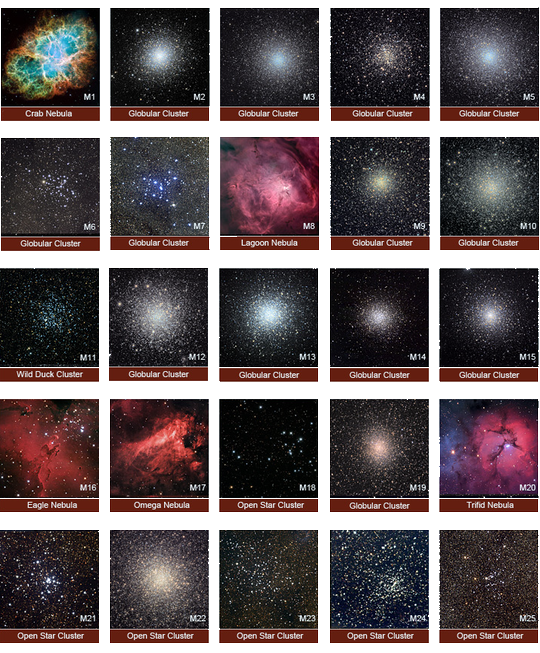 Messier observed using various scopes, none of which were bigger than 8 inch, most were 3 or 4 inch in aperture and of inferior quality to today’s telescopes. Messier observed from the Hôtel de Cluny, in Paris, perhaps not ideal, but Parisian light pollution then would be much less interfering compared to the light blight of today. 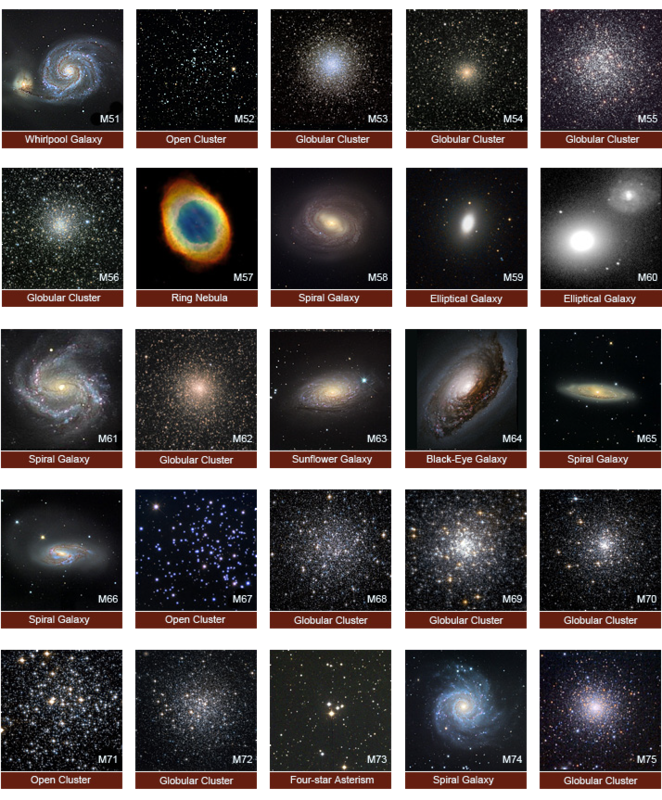 The distribution of messier objects over the sky is far from uniform, clusters and nebula are bunched along the summer Milky Way, while galaxies abound in the spring sky. Many constellations contain no “M” numbers, Sagittarius contains 15. So how do you set about spotting as many “M”s as possible? 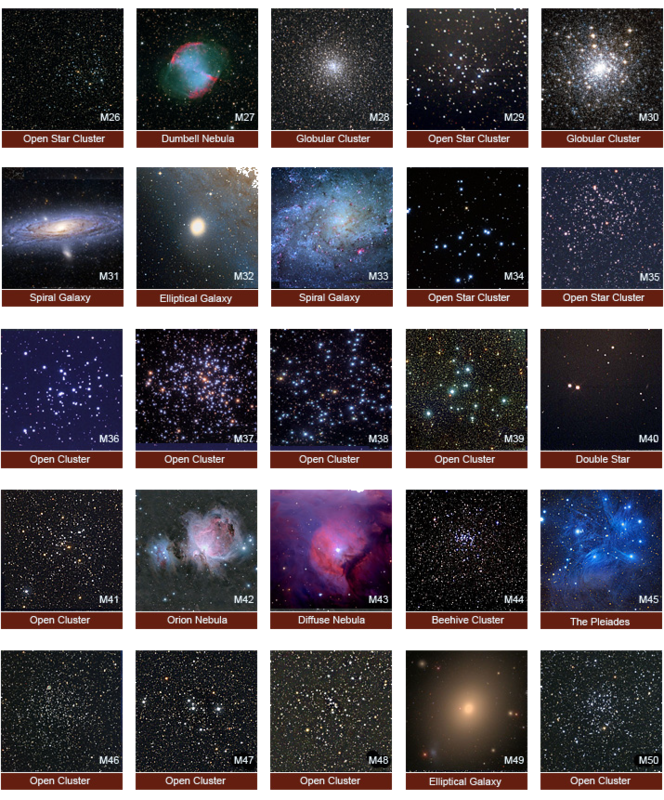 At least 80 messier objects can be seen on any given night, but due to their distribution around the sky, early spring, especially around the equinox, is suited better for observing as many as possible over the course of one night. 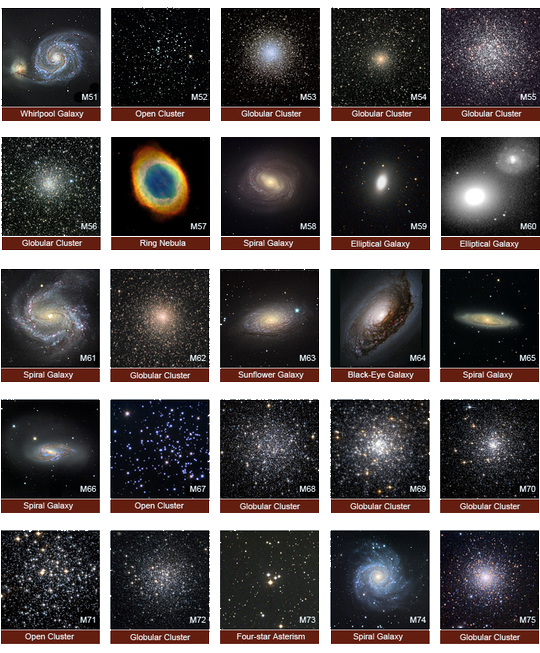 This is because the majority of galaxies and galactic clusters located in the winter and spring sky are visible during the evening and pre midnight, whilst many globular clusters and nebulae are found before dawn, when summer constellations are on view. 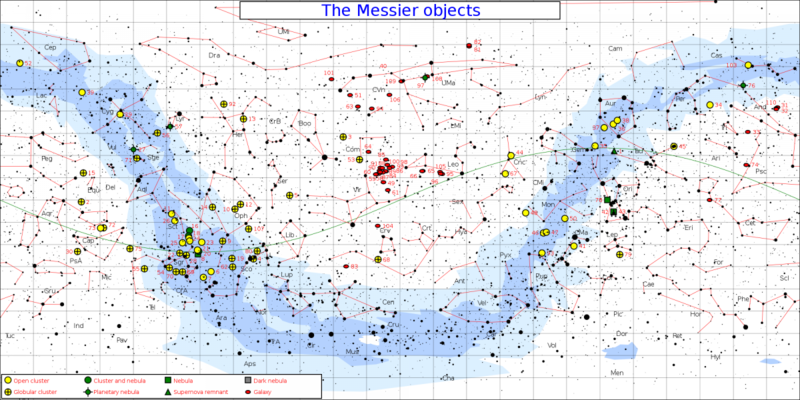 Location of Messier Objects in the night sky. Click for full-size image. The idea of the Messier marathon was actually invented in the early 1970’s, but it was not until the mid 80’s before the first complete run was accomplished. Before we go further it should be pointed out that completing the whole Messier marathon from the latitude of the UK over one night is impossible, indeed it can only be accomplished between latitudes 10 and 35 degrees north. (America, Southern Europe) Messier himself would certainly not have observed them all from Paris in one sitting. Our friend Paul Money is one of the few British amateur astronomers to have completed the challenge, though this was done from Portugal. My own personal record is a safe 72, but may have been 76...aaahh, the realm of galaxies, it is a minefield. All objects must be seen through a scope or binoculars, preferably verified if attempting a serious marathon. Goto scopes are not allowed, although a Goto marathon would be rather interesting, especially to a marathon novice. Timing is everything for a good Messier marathon. In March two objects; M74 a galaxy in Pisces, and M33 - Triangulum galaxy, have to be observed as soon as possible as twilight deepens. Whilst in the morning M69, 70, 54, 72, 73, 2, 75 and M55 all have to be picked out as soon as practicable before dawn washes them out. If attempting a 'good run' preparation is therefore essential for these evening and morning objects, whith little time to dwell on them. The midnight hours offer more time to do that. Most of the objects are actually visible in a good pair of binoculars from a dark site. Only M91 is not. Certainly a 4inch refracter or reflector will be sufficient to reveal all, although a 8-10inch reflector makes life easier, preferably a dobsonian. A nebula filter is also desirable to help show up some of the more diffuse objects. You can of course familiarise yourself with all the objects at leisure over the course of a year before setting out on a serious attempt - something i would strongly advise. The messier marathon compliled below (half marathon perhaps?) is one i have completed on several occasions and concentrates on the brighter or more important objects accessible to binoculars and small scopes. This would constitute as a pretty decent first attempt. 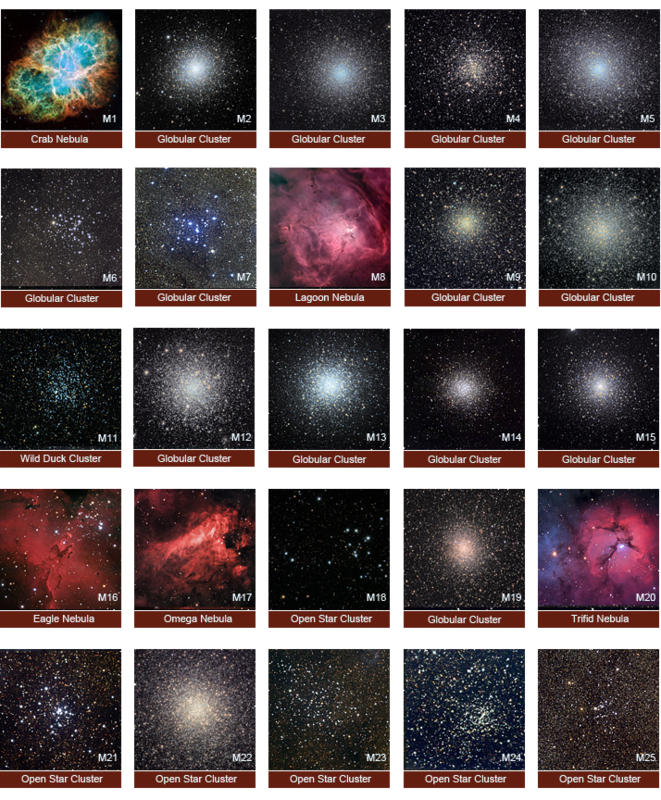 You may find the simplified map of all Messier objects helpful for quick location, but a good star atlas is really useful. M1 - locate zeta Tauri, the star marking the southern horn of Taurus. The Crab nebula is close by – telescopes only. Use averted vision to aid observation..
M35 - A small hop up into Gemini to locate this large galactic cluster at the foot of the twins. . M36, 37, 38 - travel North into Auriga to hunt down this trio of open clusters, then... M42/43 - the Orion nebula in all its glory, use different powers, also look for M78 as well... M41 - down to Sirius, below which is the easy galactic cluster M41. M46/47 – galactic clusters are found a stride to the upper left. M50 – fine galactic cluster in Monocerus. Back to Gemini and turn left into Cancer. M44 - buzz buzz, it’s the Beehive cluster in Cancer, use higher powers to locate M67 below. M13 - in Hercules is a magnificent globular cluster and will take high powers... also in Hercules another globular cluster M92, is worth finding. M57 - the Ring nebula in Lyra is a must for scopes, also try finding M56. M27 - can be spotted with binoculars and does resemble a “Dumbbell” by which this planetary nebula is known as when viewed with a scope... not far below. M4 - in neighbouring Scorpius is also a fine globular, but the other objects can be difficult due to the Southerly declination. M72 and curious M73 chance pattern of faint stars - in Aquarius are fairly easy, and before it becomes to light try..M2 - also in Aquarius and an exceedingly fine globular... while to the North in Pegasus.. M15 - is another fine example of a globular cluster which rounds off our marathon nicely.